Well i'm not about to create yet-another-account on another site, so you should really allow users to vote without having to do that. Anyway, I would choose option A). I would like to see a iso for pen drive with easy setup instruction to make pen drive bootable with the iso. what, exactly, is not clear in "since anyone enough skilled will be able to create a Icaros stick from a regular release of the distribution, I have no plan to create a proper ISO or something similar"? And yes. You can answer here (on AW.net) to the poll on Icaros website. I'm often here. Last edited by paolone on 24-Mar-2010 at 10:25 AM. Does AROS boot of an SD card? It depends on how the card is connected. I don't know if any built-in card slots work with AROS, but it would probably work with a USB card reader. Perhaps you could brand the stick then. Last edited by saimon69 on 24-Mar-2010 at 04:44 PM. Thnx Saimon, that was a nice one. OS4 on Intel has been argued about at least since I joined AW but I would not want hold my breath for that to happen. AROS is the natural choice if you want to go x86. what is the meaning of work partition etc on a stick? i only want the iso to install the aros in my hd. in the end, i would prefer option A but with the ability to install the os in hd. something like the linux live cd/dvd. Last edited by amije on 24-Mar-2010 at 07:28 PM. Even though I like the Aros project and it is developing very good I really don't see a reason for a transportable Amiga OS right now. 1. To install it on a Netbook, that doesn't have a CD- Drive. Maybe you can show of a OS to someone else, but these occasions are so rare that I don't think it is really essential. So why the heck do you need Aros on a stick? I think you've answered your question yourself. Mainly for easy netbook install, and showing off Aros to people. When AROS gets NTFS support it will be useful to backup / rescue stuff too. Wow that looks good or what. I can take aros to work and that's good news. as long as the computer has a CD/DVD drive, you don't need a USB stick. It might be faster, but not essential. when the first LInux systems became available for USB sticks I was super impressed. But when I installed them on my USB stick, I noticed that I almost don't need them. Only for rescuing stuff on Windooze machines. It might be also interesting for showing it off to your friends, but from my point of view it will be enough to write a "How to" and include it in AROS, so that people that want to have one can do it easily by themselves out of AROS. 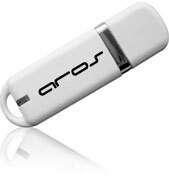 does the USB version of AROS support persistant changes, or will everything be on default after rebooting? Being the AROS installed on the stick a full install on a removable disk, it does allow persistent changes; i made my own set-up, put my own wallpaper, created my backdrop files for icons to be left on desktops (with a text file since the "leave out" command does not work yet) and set up the default network card (rtl8168 that is supported by my wife netbook). @paolone does the USB version of AROS support persistant changes, or will everything be on default after rebooting? Yes. I wonder why it shouldn't. Just make all the changes you like and launch installaros: they will be kept also on your hard drive after installation!